Whats in my school bag? – Carry on Beautiful! 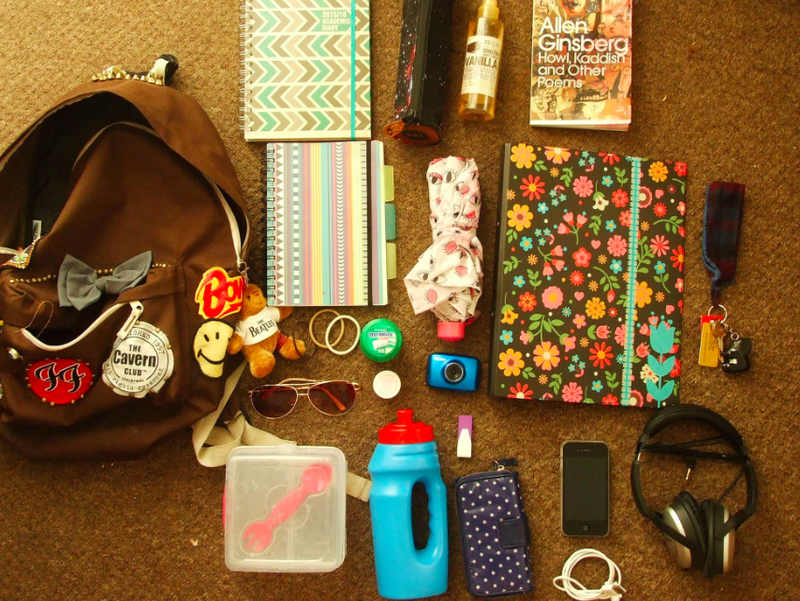 I’ve seen a bunch of blog posts recently about what people keep in their bags and i thought it was an amazing idea! Until now, i pretty much thought ‘Whats in my bag’ related content was only for youtube so i’m super excited that its branched out a bit. Heres my college bag! It’s only my first year of college and we’ve just about started so its not really super full but here’s more or less what i keep in my bag. As you can see, the contents of my bag is quite self explanatory. My bag is from Amazon and i’ve added all the accessories my self cus i’m crafty like that. The chevron planner next to that is what i used at the very start of the year but i have since updated to a watercolour pattern one and a bullet journal. Which book i have in my bag varies greatly. At the time of this picture i was obviously carrying ‘Howl’ around with me but now more often than not its ‘David Copperfield’. The other things in my bag are pretty standard, purse, phone, charger, folders, perfume, pencil case, the usual. I hope you’ve enjoyed this post even though its super short. Some of you might have noticed that my schedule is actually for sundays and wednesdays but i was super ill over the weekend and couldn’t get one up! Sorry!